As I was strolling through my garden earlier this week, I noticed that we had a lot of blooms on the zucchini plants. I swear, 2 short days later, I had 10 zucchini that were already begging to be picked! Healthy, low-carb zucchini pizza boats. It seems like every year I make the same recipes that use zucchini: Zucchini Bread (see recipe), Zucchini Pasta, and Zucchini Fries. This year I decided to lighten things up a bit in regards to the consumption of carbohydrates. That meant that the bread and pasta were definitely out of the recipe rotation. So instead, I combined my favorite carb-loaded meal, and made it a tad bit healthier. 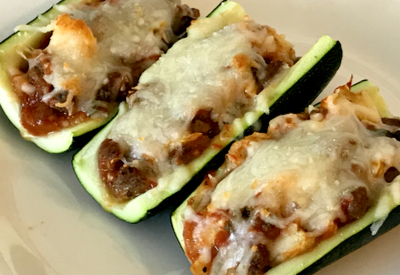 Zucchini pizza boats are super simple to make and you can customize them to each individual’s preferences. After cutting the zucchini in half, scoop out the center for the fillings. After scooping out the center of the zucchini, be sure to dice it up before adding in the sauce and toppings. To make scooping easier I use my melon ball scoop or ice cream scoop as it is strong enough to get through the raw zucchini. Then add in any toppings of your choice. For instance, you can stick with the typical pepperoni pizza style of marinara sauce, mozzarella cheese and pepperoni. Or for that matter, even just sauce and cheese for those that like things a little less complicated. Mix in the toppings of your choice with the sauce and cut out zucchini. However, I prefer to add in a little ground sausage as it holds up well in the zucchini boats. Of course, to try to make things a little healthier, I used turkey sausage. But you could add any typical pizza topping to switch things up a bit! You could even use non-dairy cheese to make it vegan friendly! I also made a batch of these in my BCP 5.5 quart Air Fryer. I baked them at 370 degrees F after pre-heating for 3 minutes. It then took about 10 minutes and the zucchini was tender and the toppings were melted perfectly! A low-carb meal that gives you all of the flavor of a pizza, but served open-faced in a hollowed out zucchini. 8 ounces ground sausage cooked. Line a baking sheet with parchment paper and set a cooking rack on top. 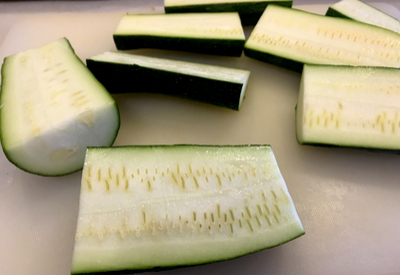 Cut each zucchini in half horizontally, then each section cut in half. Scoop out the center of the zucchini, leaving about ½ inch of zucchini on the skin. Place the removed contents in a medium sized bowl. Dice the removed zucchini centers into small pieces. 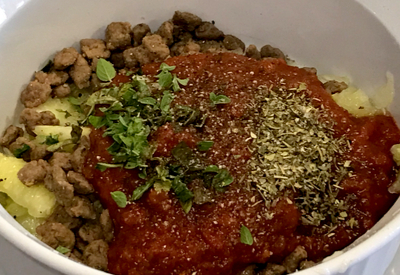 Add cooked ground sausage, Italian seasoning, salt and pepper to the bowl with the diced zucchini. Stir in marinara sauce. 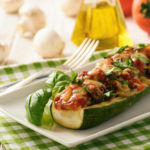 Fill each zucchini boat with the mixture and sprinkle with mozzarella cheese. Place into oven and bake until the zucchini is tender, and the cheese has melted, about 15 minutes. Remove from oven and garnish with Parmesan. Air Fryer Cooking Instructions: In a preheated air fryer, cook on 370°F until tender, approximately 10 minutes.